SPACE STATION NATHAN: Last One, I Swear. 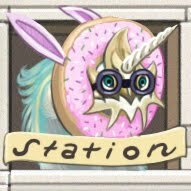 Donut, Unicorn Horn, Goggles and Bunny Ears. Okay, I think I've gotten it out of my system. You're just doing this so you can stick us with a Friday cliffhanger in the Taco Hell story, aren't you? hahaha! Love the new mascot. Oh dear. I certainly hope it's out of your system. Quiet stalling and get on with Taco Hell please. Please finish the Taco Hell story!!! PLEASE!! !